I asked a question on Twitter and boy did it get responses. 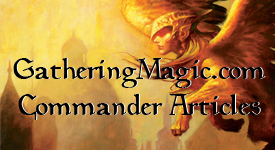 “Do you want an EDH deck clinic?” Yes was the response, overwhelmingly. In fact, I don’t think I got a single “No” answer. Whatever the people want, we do. Here’s how it’s going to work: Send your decklist to 99EDHProblems AT gmail.com. Tell us why you want it fixed (having trouble with the local metagame, deck’s not working right, people laugh when I play this card), and your access to cards (Can get older (pre-Onslaught), just started out, etc) so we know what kind of cards to suggest. Yes, original duel lands make every deck better but we know not everyone can get access to them. We can’t promise we’ll get to all of them quickly, but we’ll scatter these deck clinics out, maybe once every two weeks or some variation of that. We’ll always be looking for new decks, so keep submitting them, please. It could be your first EDH deck or your 25th, it always helps to have another pair (or several) take a look at your deck. Do NOT post them to comments down below, or send them to me on Twitter; please e-mail them to the e-mail address. Thanks everybody and the DOCTOR IS IN! This entry was posted on Tuesday, February 16th, 2010 at 1:26 pm	and posted in EDH, EDH Deck Clinic, Magic: the Gathering. You can follow any responses to this entry through the RSS 2.0 feed.